I came on your website a couple of years ago in great distress at having to rehome my beautiful dogs and you were all marvellous in helping out so thank you. However, I have just seen that my standard schnauzer Lubo is back in Jerry Greens dog rehoming centre in Lincolnshire as his home obviously did not work out. In the spiel underneath his photo it says 'Lubo requires someone who has experience with this breed and understands their personalities'. I know its a long shot, but if anyone was looking for a schnauzer that wasn't a puppy please do contact Jerry Greens - the link is below. He looks quite happy there but in desperate need of a proper standard haircut! I am heartbroken to see him still there and would love for him to find his forever home. Lubo is gone,....... home, home! Hope that he is going to have love, good food and a sofa like he had in good old days at your place, or maybe better!!! 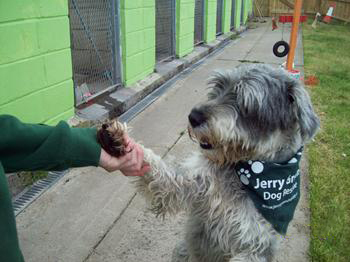 I'm so happy for you and him sending you this http://www.jerrygreendogs.org.uk/RehomeADog/ShowDog/Broughton/2011-04-19/lubo, just in case you do not have one. and belive me this is terrible place there! Best of everything for you and your family! I'm so happy for him with all my heart...please let him be happy this time! I know, of course you did and do love him and I'm sorry that I have make you worry about him! You are now pregnant and you should only be on the happy face, remember! I do think that some one will find him soon! This Jerry place looks very much OK!!! They do not have that many dogs to look after, it is almost like a hotel and he like those people who are taking care of him, they are very nice to all of the dogs in their care. He will be all right, after all he is a Schnauzer! They are the best of all of the dogs! All the best for you and keep inform ourself about him and baby. Wishing you all good! I would love to him back of course I would. I am pregnant though and my circumstances haven't changed, I travel for work for 4 hours a day and I cannot afford a dog walker. I think half of the reason we ended up in this state was relying on a paid behaviourist who actually ended up giving us very bad advice. Hi Jo! I was shock and so sorry, when I saw Lubo sad but happy to be back at Jerry Green, like he was saying look what they've done to me, please take me back because I love you. Now it is sad but I know why he is back. Jo, you’re sure you don’t want to have him back for yourself? Sorry, I know I have no rights to say things like that. Have you ever seen Cesar Millan show, hi is DOG WHISPERER look at his page http://www.cesarsway.com/channel/dog-whisperer-tv actually everyone who has a dog should learn from him haw to be happy with a dog!! It is very good for knowing how to make your dog happy and knowing yourself so you can have the best friend no matter what. Best regards and all the best luck to Lubo Very Brave Doggie! It says on the website no children. Is this actually the case or do you think he would be ok with older experienced children? I would love to help him out and am not put off by his fear/dominance issues, but if kids are a definite no-no, then I can't help. I already have a Mini Schanuzer too who might help to settle him. Yes I saw this. He looked very happy. What a lovely thing to do. I am well aware that a haircut doesn't make a dog loved :) I was just pointing out that he needed a bit of a trim ha ha. Really? He is reserved? I couldn't be happier. :)) i will watch his progress with interest. North Lincs Centre wanted to share this one with you all - and say a huge thank you to Naomi Marlow who saw Lubo the Schnauzer on our website. She fell in love with him, but having two dogs of her own was unable to offer him a new home. Instead she sent a parcel of treats and toys direct to our North Lincs centre marked for Lubo the Schnauzer. Here's a photo of Lubo with his parcel. We can safely say that Naomi sent a little sunshine on a grey and winterey day to our Lubo. The power of love indeed. xxxx"
This is what has happend to LUBO, I'm so happy for Him! Also the best news is, that he is RESERVED as well! I'm in love with him, I was going to visit him and rescue, but Jerry BOSS was not very helpfull, well maybe is for the better for LUBO! My husband do not speak English and he could have a problem with him. You Jo should have lern something young Lady, dogs are not only to love when they have nice hair cut! I'm so happy for you LUBO! i spotted lubo, last night and contacted them today - they didn't call back, so I rang again ! The lady dealing with it is not around until sunday, and they tell me that we need to visit 3 times befire they consider an adoption. We are 3 hours away so not easy. we have just lost our schnauzer after 16 years and would love to rehome lubo- but it doesnt look as if is meant to be . No it says he shouldn't be with other dogs or children and I agree - I did used to have two (my girl was called Poppy- good name!) and they used to fight a lot so don't think it would be any good for you. Am absolutely desperate for him to find amazing owner, I know someone out there would be brilliant for him. We have to be really sure before we can make a commitment as Poppy is so happy with us and we with her, we don't want to upset she.